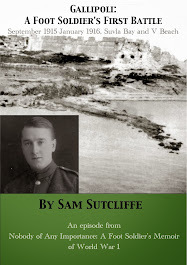 I'll read excerpts from my father's experiences – touching on the poor London childhood that "made" the Tommy, then Summer 1914 and the enlistment fever that saw him join up in September, his terrible and even sometimes terribly funny experiences of the trenches at Gallipoli (Suvla Bay, V Beach with the 2/1 Royal Fusiliers), the Somme (including July 1 at Gommecourt with the Kensingtons), and the battle against the Spring Offensive outside Arras (Fampoux, his Company and 2/7 Essex Battalion's fight to the last bullet), his eight months as a POW wandering occupied France and southern Germany, Armistice as viewed from a camp in Lorraine, his long trek back to the French Front (including the bit through a minefield), his homecoming and further adventures during the months through to July, 1919, when he attended and riotously enjoyed the Peace Parade. If there's time. Well, at least a flavour of all that will be attempted. 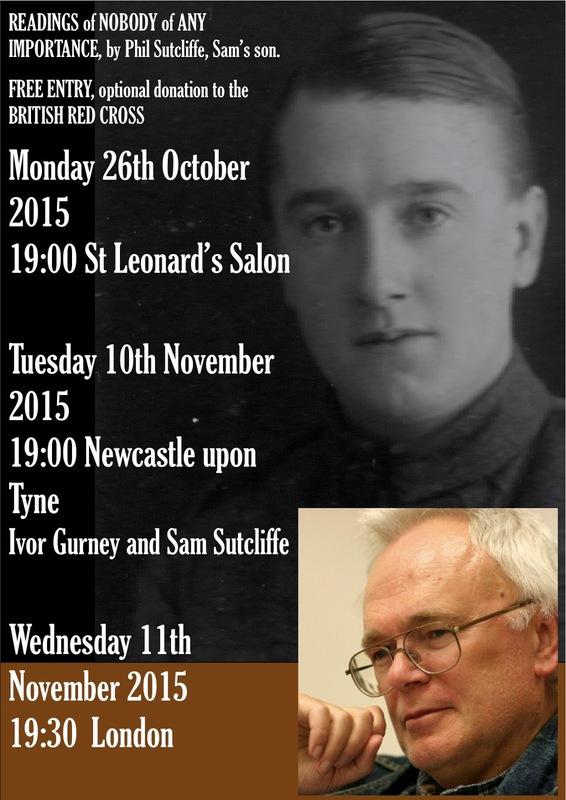 Free entrance, but a donation to help with Newcastle upon Tyne WFA's running costs is requested. Non-members very welcome. … more details nearer the time. The above leaves rather a lot of unreading days as the Remembrance movement plans its future programmes of events through 2019 and on into 2020 – after all how could we allow "We shall remember them" to become "Oh, forget it"? 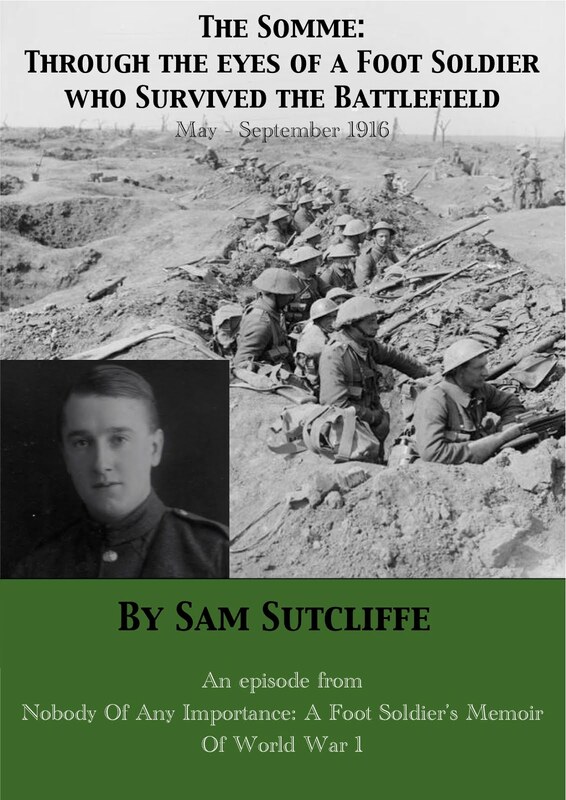 Foot Soldier Sam's World War 1 in his own words: Lance Corporal Signaller Sam Sutcliffe's son and editor Phil reads excerpts from his father's story of World War 1. 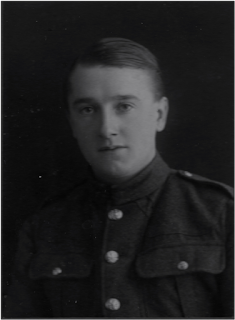 The Memoir covers childhood through to volunteering at 16, then front-line eye-witnessing Gallipoli, the Somme, the Spring Offensive, and his months as a POW through to Armistice and the Peace celebrations of July, 1919 – when he was just 21. Lance Bolton of Royal Chelsea Hospital ©️2016. 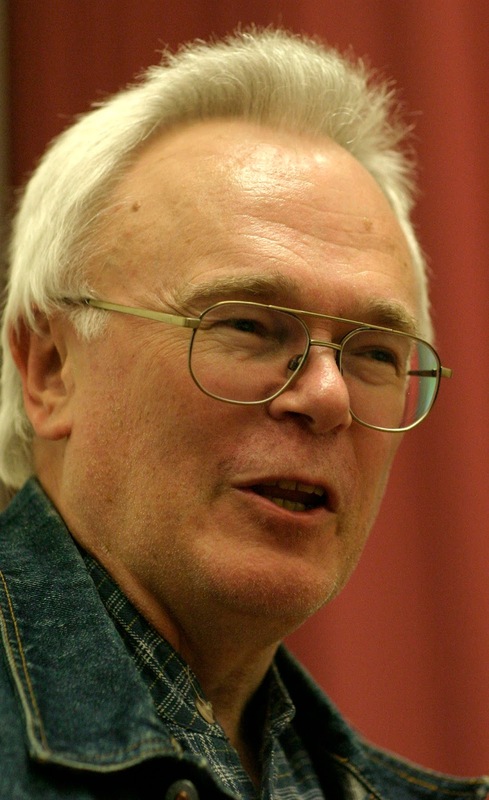 Phil is happy to talk about the remarkable man he called "Dad", how the Memoir was written, and encourage audience members to discuss any aspect of WW1 – or any war – especially their own stories of family members caught up in such conflicts and how it has affected their own lives. The readings are free•, their purpose to record the essence of a First World War Tommy's experience, ensuring it's understood and not forgotten. 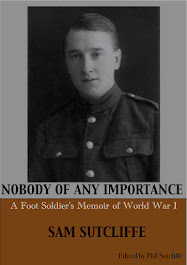 Paperbacks of the Memoir will be available to buy at all readings. 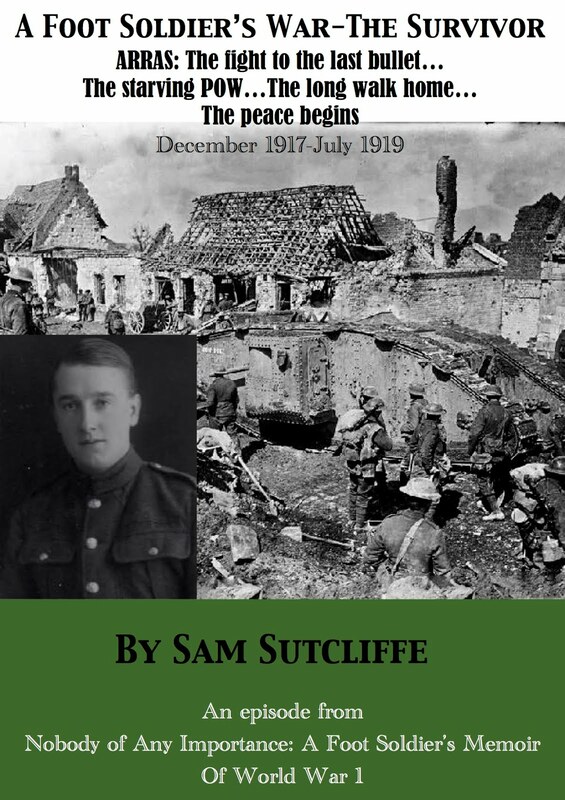 All proceeds from Sam's writings in all formats go to the British Red Cross (paperback £10, £4 print costs, so £6 to the Red Cross - £3,772.16 raised as of December 4, 2018). Email philsutcliffe47@gmail.com or phone 020 8674 9397 to discuss bookings. * Essex Western Front Association, Hornchurch, April. 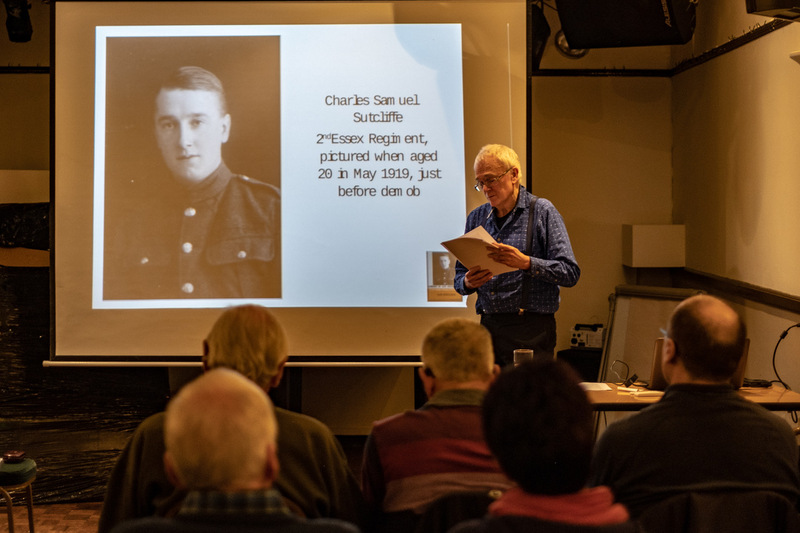 This event sadly turned out to be in memory of Bill Fulton of Essex WFA and Malcolm Doolin of Walthamstow (London East) WFA who both died quite suddenly in the couple of weeks before the reading. Both much missed by everybody who knew them and the whole WW1 Remembrance movement. * London Central Western Front Association, Waterloo, May. * London East Western Front Association WW1 open day at St Mary's Church, Walthamstow, September. 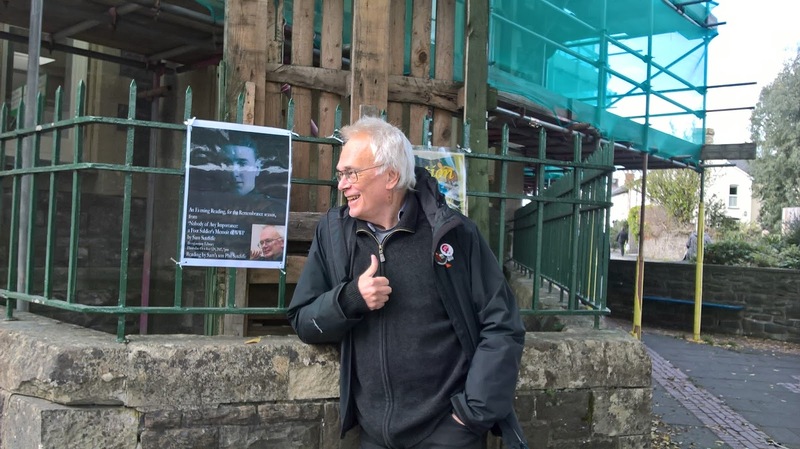 * Wiltshire Western Front Association, Highworth near Swindon, October. * Surrey Western Front Association, Cobham, November. * Norfolk Western Front Association, Norwich, January. A brief history of Sam's son, Phil: 71, a Londoner, has been a journalist all his working life, freelance mostly, writing about music – articles listed here – sport and many other interesting matters. Outlets have included Mojo, Q, Los Angeles Times, Total Sport, Sounds, Smash Hits, Time Out. He also wrote books about The Police, AC/DC, and Queen, before latterly turning to editing and publishing Sam's Memoir. Bruce Springsteen multi-tome always on the go. Library before the October, 1917 reading. Pic by Phil's wife Gay Lee. – designed by Hina Pandya.